I seriously can't believe how quickly June has gone. We're over halfway through 2016 and that's definitely going way too fast! June has been a month of ups and downs for me, but I've still got plenty of bits and bobs I've been loving to share with you. Like May, there are mostly beauty and makeup products, but being on my summer break I've had a lot more time to experiment and try out new things. Starting off with skincare, I've been loving the Clinique Dramatically Different Moisturising Gel. I first started using the lotion version when I was about 14/15 as it was the only thing that calmed my skin after an allergic reaction to a cleanser. Despite loving it I didn't repurchase as it was well out of my budget back then. My skin, especially my t-zone seems to have gotten oiler whilst other parts of my face have become dehydrated, as nothing was working that effectively I thought I'd give the gel formula of a previous favourite a whirl. I'm seriously glad that I did. It's the same yellow colour and fragrance free, but the gel is so hydrating yet light on my skin. The areas that need much more hydration are still hydrated, whilst the oiler areas aren't swamped in a thick and greasy cream. It's perfect. Sticking with the gel theme, I've really been enjoying using the Benefit Porefessional Matte Rescue gel primer. I've never tried the orginal primer, but about a month or so ago I thought it would be interesting to try out the gel formula, having never used a gel primer before. I have to say I've been really surprised by it. I thought that perhaps I would still need a bit of primer over my nose, to really lock in makeup as well as smoothing over pores and reducing shine, but this does the whole lot in one. What I like the most is that it's a really good primer, but it still feels so light on the skin. It's quite refreshing to apply, and really does elongate the wear of my makeup whilst reducing shine as well. It's a win win. Another makeup product that I mentioned in my Summer Essentials post is the bareMinerals Mineral Veil. Since purchasing this mid April I've not even looked at another powder. This sets my makeup perfectly, my under eye concealer no longer creases, I barely need to touch up my makeup during the day - only if it's particularly hot or I've been wearing makeup a very long time, it's really made a different and I'm obsessed. I have the orginal Mineral Veil which is translucent, and looks perfect over my foundation. I've never really used a loose powder before so I was a little curious to see how it would compare to my pressed favourites but there's no comparison as far as mattifying goes, this wins every time. If you've read my perfume collection post, then you'll know my love for perfume is real. I love being able to chose a different scent each day, although the past month or so has seen Daisy by Marc Jacobs become a real go to. It's such a beautifully floral scent, ideal for spring and summer and I've been loving wearing it both during the day and in the evenings too. I can sometimes find that perfumes that are light and fresh enough to wear during the day can be too light in the evenings, but Daisy is ideal for any occasion this summer. A bit more of a random love this June is stripes, I've become obsessed. I have so many striped tops and shirts that have been rotating round my daily wardrobe, and I find myself drawn to striped garments when I'm shopping too. I think they look really cute and summery, especially as they have a nautical vibe to them, and darker colours like navy work really well on the less sunny days in Britian (most days let's face it!). You can find out which blogs I've been loving here and catch up on my blog posts from June here. 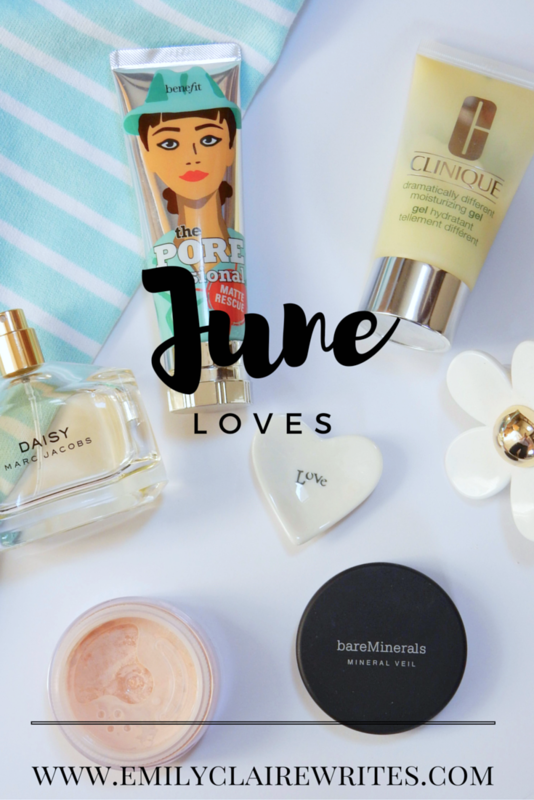 What have you been loving this June?